A democratic challenge to the privatisation of education is rising. Wednesday, 11th December 2013, thousands of students, university staff and others concerned of the recent crackdown of the right to protest and the future of higher education marched around Bloomsbury in central London. There were also actions in other parts of UK as a response to a call-out for a national day of action. It was a mainly cheerful crowd carrying banners and placards saying “all I want for X-mas is the right to protest” and “Our University: Fair pay and contracts for all staff – end to privatisation”. The black bloc was there too, as were the samba band and clown army. After marching around the University of London building of Senate House, SOAS and Birkbeck universities, some managed to break the gate into Senate House premises but not into the building, while others remained outside SOAS for a brief sit-in to challenge the injunction prohibiting occupational protests in the area. 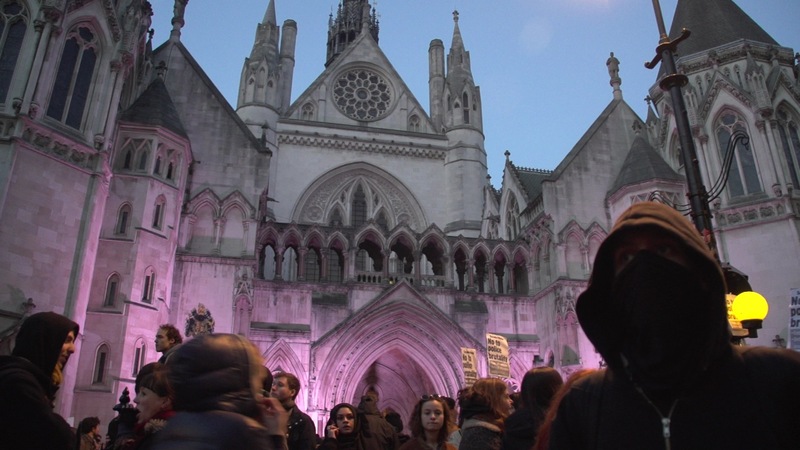 Some of the protesters then made their way south from Bloomsbury, heading towards the Royal Courts of Justice where the inquiry into the death of Mark Duggan is drawing towards an end. 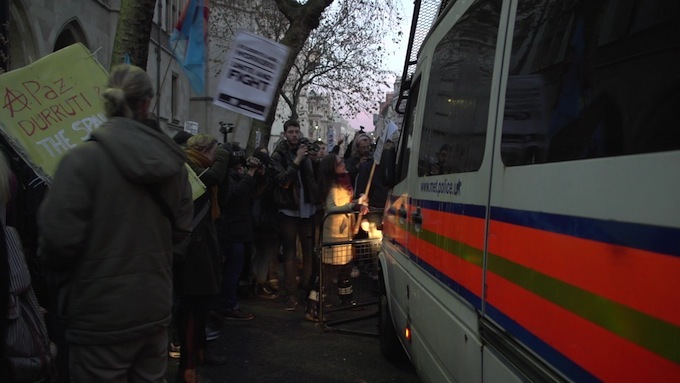 Police brutality has indeed been what has sparked this new wave of student movement, and it is important to remember that it has long been an issue in the communities of London, especially amongst people of colour. There was a lot to celebrate about yesterday, not least the feeling of unity. The absence of police was undoubtedly a deliberate strategy from their side – however, the observation that there was no riot without the riot cops is a noteworthy one. What was it then that brought thousands – media coverage varies from 1,500 to 4,000 and I’m pretty bad at estimating numbers myself – of people onto the streets? 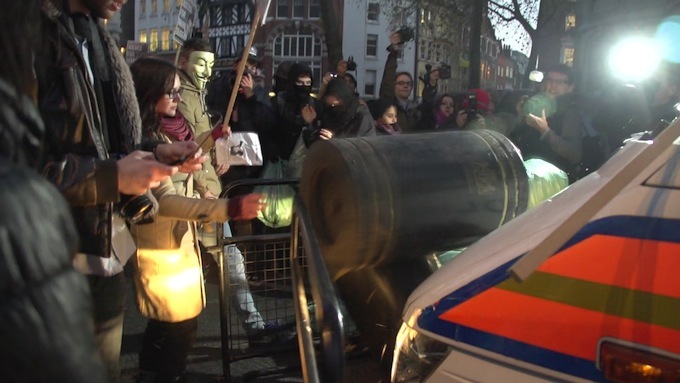 On the surface it was about #CopsOffCampus. There has for a while now been an increasing police presence on university campuses in London, from the arrest of a student chalking slogans at SOAS last June to the arrest of University of London Union (ULU) vice president when he tried to interfere with ethnic profiling in a drug raid to the arrest of ULU president for organising against the closure of the biggest independent student union in Europe. 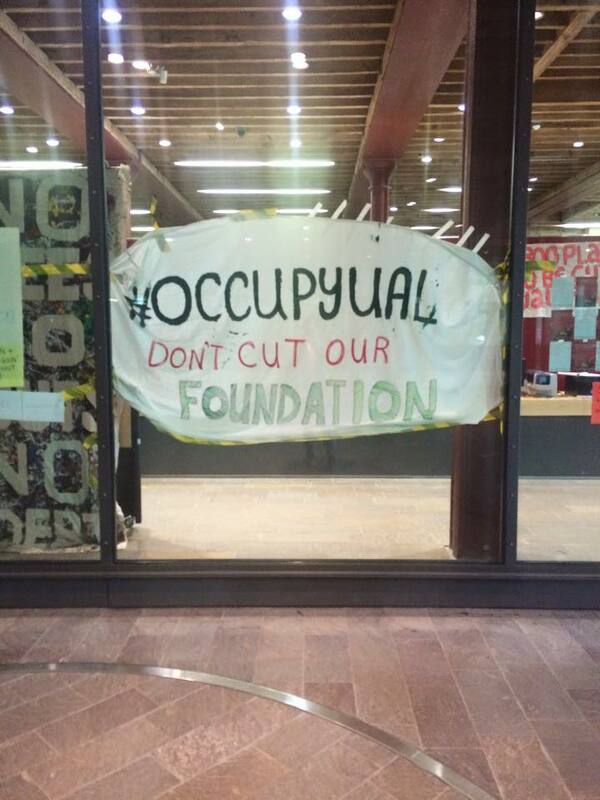 The straw that broke the camel’s back was the eviction of an occupation in Senate House last week. 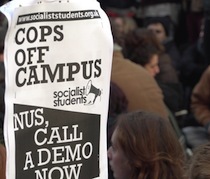 University occupations have traditionally been a legitimate tool for students to put pressure on their management – but this time, police came in within hours and without a possession order. 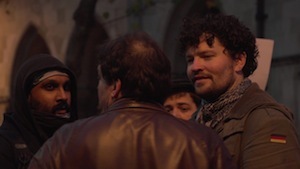 The occupiers were dragged out, and when cops pushed everyone off university premises with aggression, arrests followed. So did protests: when hundreds took to the streets in the following days, the police responded with a further 38 arrests, including passers-by, student union officials and press. Yesterday’s protest was called. Protesting about the right to protest, however, clearly doesn’t give the entire picture. Universities in the UK are changing. 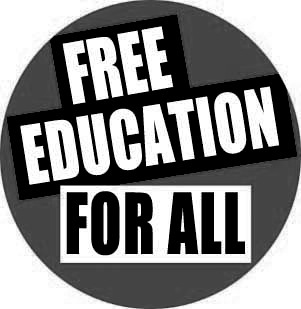 When the government came to power in 2010 and launched an attack on practically every public good one could imagine, higher education was the first in the line. Many of us still remember either the smell of burning items outside Parliament or at least the pictures in newspapers. The single-issue battle was lost, unsurprisingly, and fees were tripled to £9,000. Education maintenance allowance was scrapped too, which received a lot less attention. There were fears that students from less fortunate backgrounds would not go to university anymore as the debt burden would become unbearable for anyone else than middle-class kids whose parents could chip in. No worries, said the government: the terms and conditions of student loans are favourable, and there is no need to pay back if one doesn’t get a job. Fast forward to end of November 2013: the government has started selling off the student loan stock to private investors. A report from an investment bank, seen by the Guardian last summer, proposes lifting the cap on interest rates to attract investors. That is in effect a retrospective hike in fees. At the same time, public funding to not-so-productive subjects such as arts, humanities and languages is scrapped. Who would value knowledge and understanding for its own sake, if it can’t be made into money in the wheels of the capitalist system? The lecturers’ union, UCU, has been on strike twice this term. That is the response to an offered one per cent pay rise; in real terms, they have seen a 13 per cent decline in their salaries since 2008. Universities also rely largely on teaching assistants and part-time staff who aren’t even paid for enough hours to run the courses they do. Or course this is a disgrace. Still, it is important to remember that this is not just about the UK government and higher education. It is about 21st-century capitalism. Throughout its existence, neoliberalism has needed the strong arm of the state to enforce policies that do not benefit the people. The last 30 years have seen a steady decline in real wages and massive increase in asset wealth – not to speak about the increasing levels of financialisation our personal economies as well as states have been subjected to. The heavy police presence – and like last week, straightforward aggression and brutality – on the stages of our struggle is hence nothing new. As well as through state violence, we are disciplined through fear: whether it is outsourced cleaners, lecturers with declining wages or students who know they will graduate into a job market that simply doesn’t exist, we are all too busy worrying to fight back. And that’s what has changed in the last week for students. What comes out of this new wave of the student movement is yet to be seen. Every now and then I am tempted to say it feels like 2010 all again. But actually, it doesn’t. It is a much more leaderless movement – partly out of necessity as any leader would end up in a police cell – with wavy hands and a new sense of unity behind a wide range of issues. There is a lot of potential. 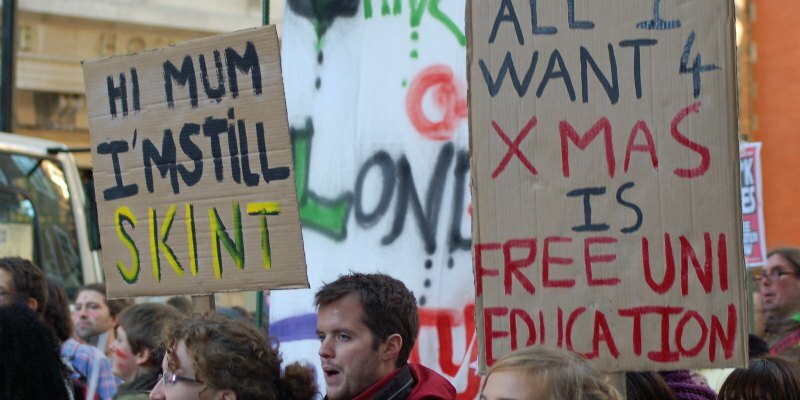 Potential for challenging the notion that education is a commodity and students are consumers; for breaking free from the chains of student debt that is disciplining us from imagining any alternative ways of living; potential for a free and critical academia that can challenge neoliberalism.